A young woman reads “Una Partita a Scacchi” (“A Game of Chess”) by Giuseppe Giacosa. Art by C. Monestier. The King of France, Louis XIII, plays chess with Cardinal Richelieu on the title page of The Three Musketeers (1929), illustrated by Mead Schaeffer. 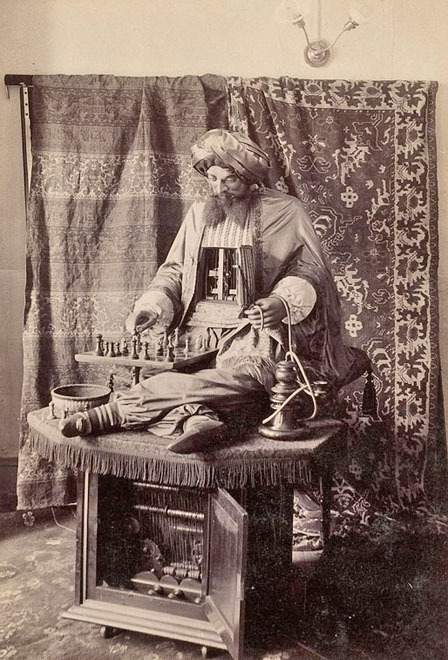 Ajeeb (1868-1929) was a chess- and checker-playing automaton, created by Charles Hooper, a cabinet maker. While presented as entirely automated, it concealed a human player inside. Ajeeb was first exhibited at the Royal Polytechnical Institute in London in 1868, the Crystal Palace between 1868 and 1876, then the Royal Aquarium at Westminster until 1877. Next came Berlin where more than 100,000 spectators saw it in three months. 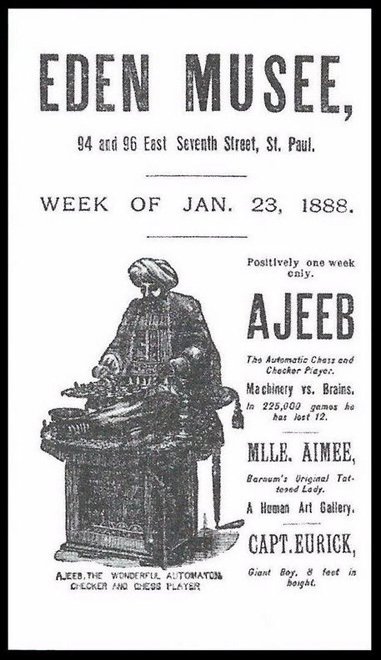 Ajeeb came to New York in 1885. 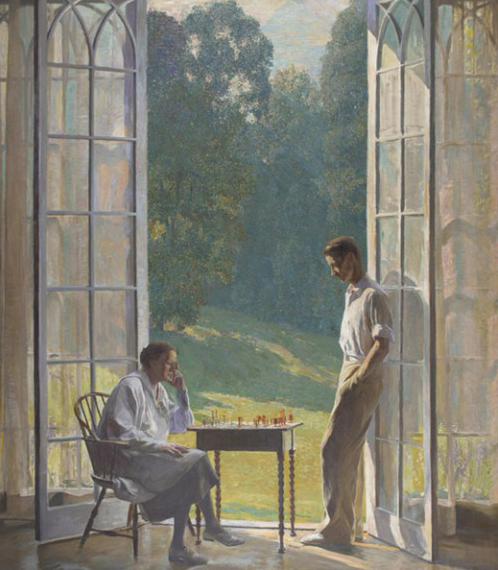 It drew thousands of spectators to the Eden Musée; you could play checkers for 10 cents or chess for 25 cents. Ajeeb’s final appearances were at Coney Island. Ajeeb’s opponents included actress Sarah Bernhardt, Admiral George Dewey, orator and politician William Jennings Bryan, British boxer Bob Fitzsimmons, escape artist Harry Houdini, Presidents Grover Cleveland and Theodore Roosevelt, baseball’s Christy Mathewson and the author O. Henry. 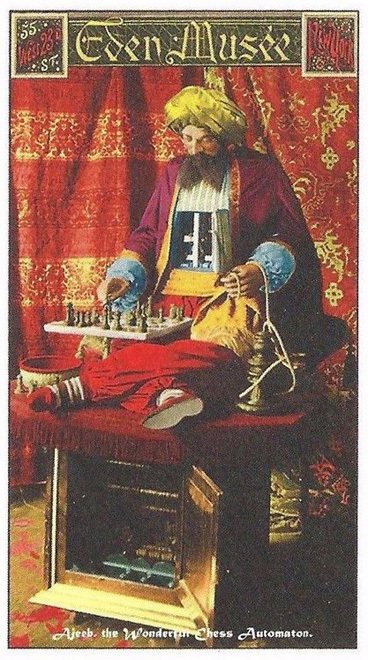 Players who served time inside Ajeeb included its inventor, Charles Hopper, and then Harry Nelson Pillsbury, Albert Hodges, Constant Ferdinand Burille (who excelled at chess and checkers), Charles Moehle and Charles Francis Barker. Ajeeb was destroyed in a fire at Coney Island in 1929.